A new friend of mine recently decided that it was high time that a group of us headed out to explore the new and improved Claremont Quarter. Some quality time perusing the shops and generally just hanging out did strike me as a delightful way to spend a morning. 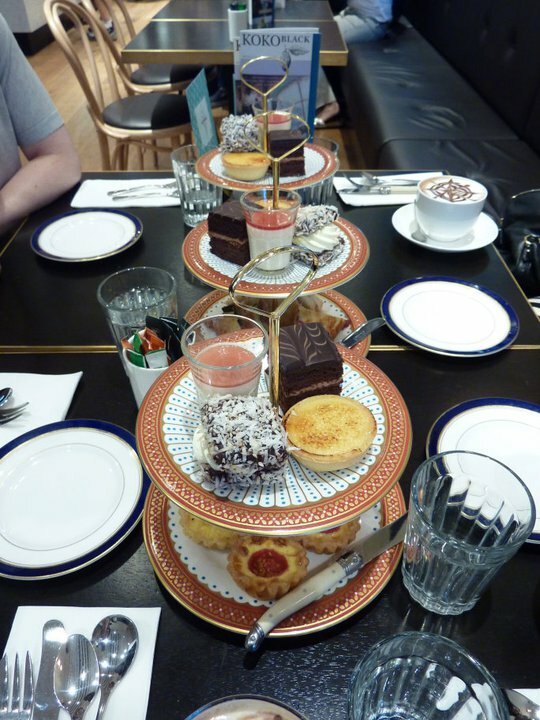 Having heard many a good thing about Koko Black on a few food blogs that I frequent I suggested that perhaps a cheeky way to start our adventuring would be a breakfast High Tea at Koko Black. It got two thumbs up from all involved so the plan was made to rendezvous at said chocolate shop at 9am. I had decided to drag myself out of bed early that morning and chalk up a few k’s before indulgencing in my chocolate-heavy breakfast. In retrospect it was a wise decision. Koko Black has been in existence over East for many years now, but it’s at Claremont Quarter that it has made its first foray into the West. And the reception for this store has been hugely positive. Given it was 9am on a Saturday, which was when Koko Black opened its doors, it was easy for me as the first on the scene to secure a table for 5 inside. Service was very prompt and you are bought a glass of water as soon as you sat down. So I sat there, perusing the menu. 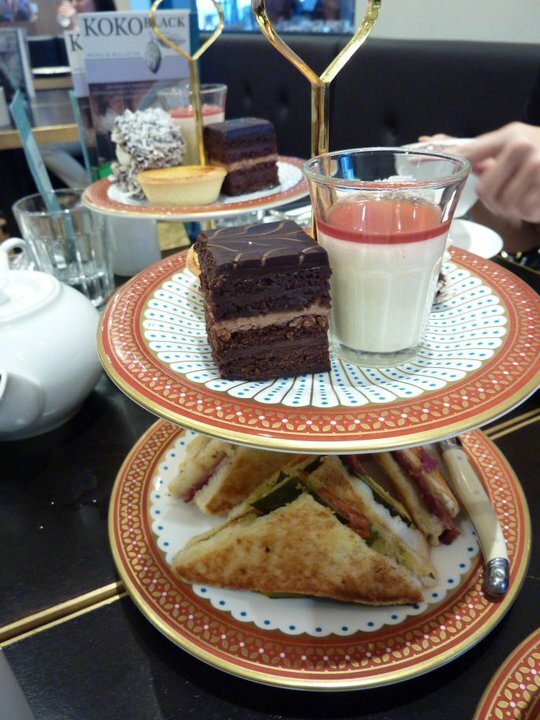 I suppose the benefit of arriving first was that I was able to chat to the friendly waitress and find out the details of their “Queen of Hearts” High Tea, which was $18.50 per person. 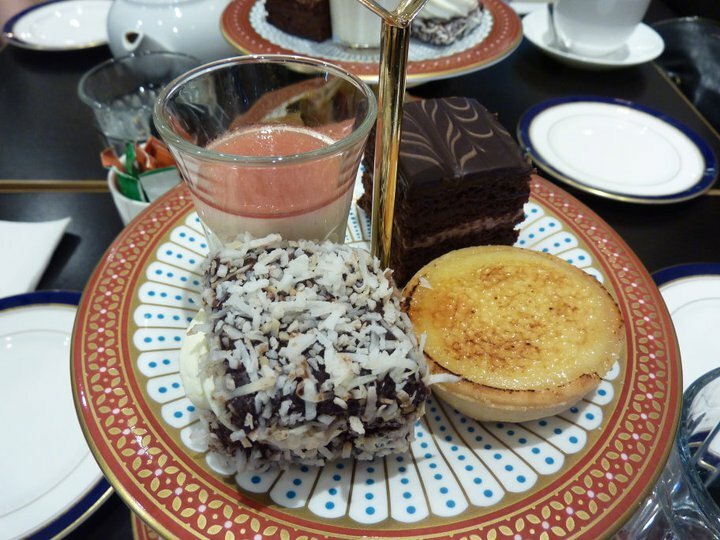 It is essentially a tiered plate with a selection of their sweet and also savoury treats. They are designed to be shared between two, which made our group of 5 slightly trickier, but we ended up basically getting 3 lots of the tiered plates and sharing it between us. So when the girls arrived everyone was on board with the Queen of Hearts option and the only decision they then had to make was whether to go with a tea, coffee or a hot chocolate or an iced chocolate (for an extra $1). 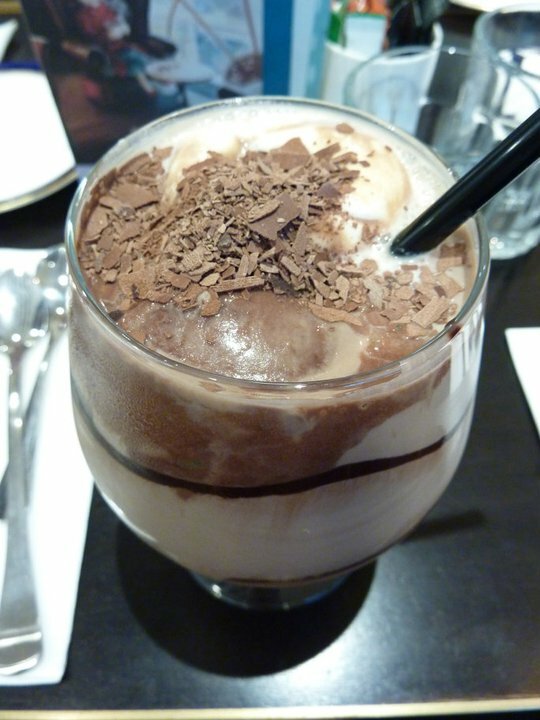 I decided in for a penny, in for a pound and all that, and went the iced chocolate as did my best mate, Maree. Others chose hot chocolates and Jane, perhaps more sensible than the rest of us, went with a pot of tea. The Iced Chocolates were a vision when they arrived. 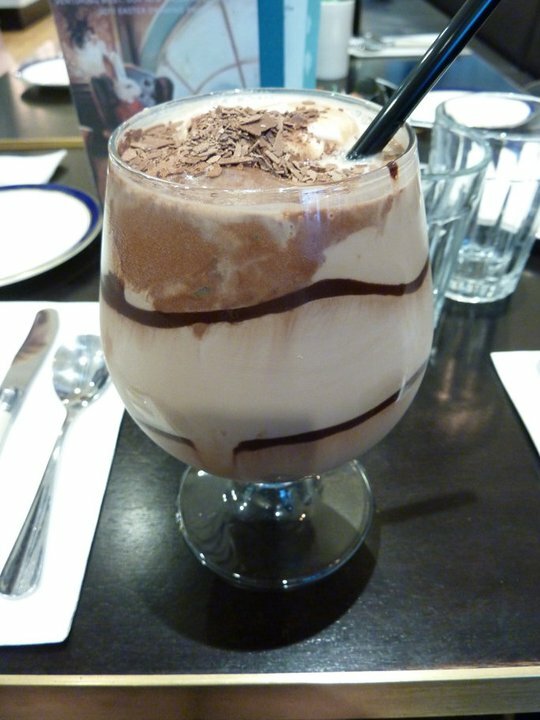 Chocolate syrup artistically swirled around the glass, a scoop of vanilla and chocolate ice-cream and then the rich chocolate milk. We couldn’t get enough! We both started strongly on our drinks, raving on about how we wished they came in fishbowl sized glasses. However as we soon found out towards the end, the richness of the chocolate intensifies and it was almost a struggle to finish. We got there though. 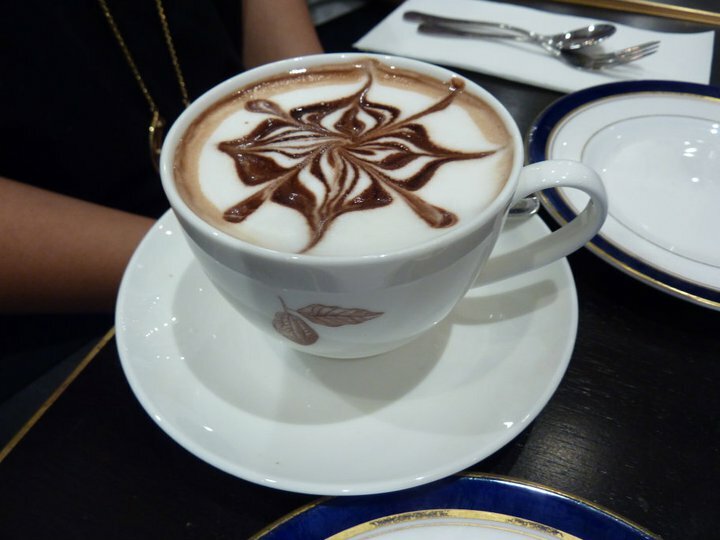 I heard similar reports about the hot chocolate – incredibly, indulgently rich. I’m surprised the spoons didn’t stand up in the glass! But again beautifully presented drinks and thoroughly enjoyed by the two ladies in question. And the food! 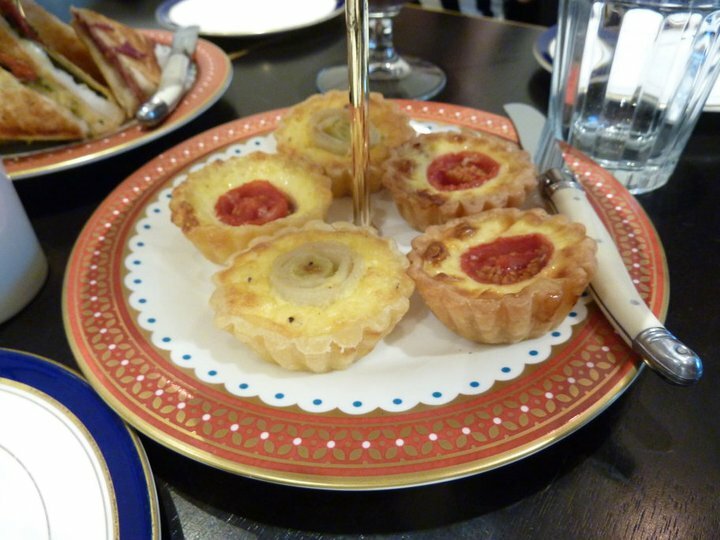 The small cakes and sandwiches and quiches all looked pretty as a picture of the delicate china plates. We all started on savouries. I though the teeny tiny quiches were delicious! A tasty mouthful indeed. Then I had one of each of the sandwiches. 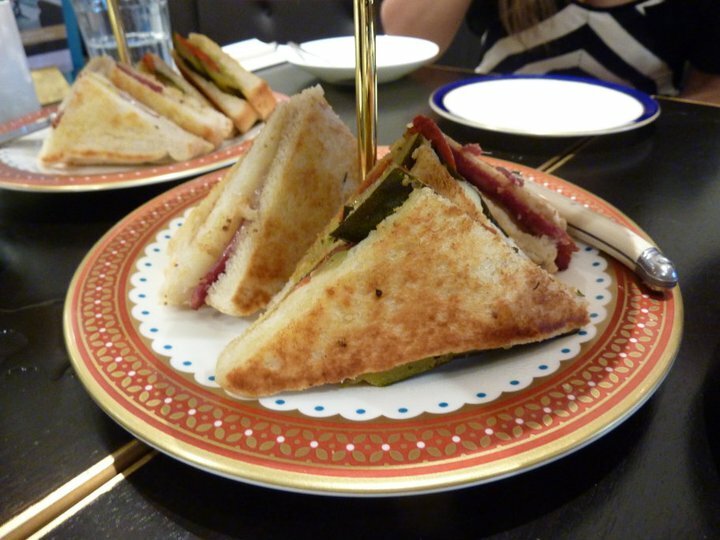 One had a range of marinated vegetables in it – zucchini and tomato and eggplant, etc, which was very nice, and the other was more of a traditional ham and cheese. It was like they had coated the outside of each sandwich with butter before they had toasted them, so it made the bread so delicious! Great introduction to their food and the savoury was a nice offset to the mega sweet drink I was working my way through. But we did then launch into the sweet options. Basically given there were 5 of us, we split both things into two and then each got one whole item each. I started on the crème brulee. It was quite nice, but the custard filling was very runny. This was only an issue because we were cutting them in half I suppose. It was also pretty early. Perhaps these needed slightly more of an opportunity to set a little bit more. Flavours were good though. Next we tried the lamington. It was tremendous! Served split in the middle with some cream and jam, it was great. Fluffy sponge and nice chunky bit of coconut on the outside. Delish! From there I had one of the vanilla pannacottas. This probably wasn’t one of my favourites. Had a really light vanilla flavour, but in all just wasn’t that tasty. I was a little disappointed with this one, perhaps it would work better with more flavour infused through it. Finally we tackled the chocolate cake. Perhaps we should have started on this one, given how crazy rich it was. Layers of chocolate cake and chocolate filling, covered in chocolate icing. It was a chocolate lover’s total delight, but I was glad for the petit size portion of it I had to get through after everything else I had eaten that morning. I was high on life and sugar by the time we left Koko Black. 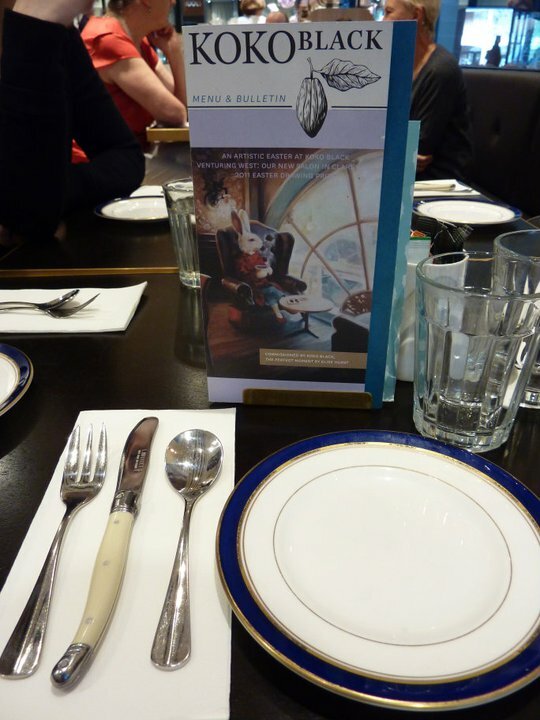 The things that struck us about our visit, other than the obvious (which is that chocolate is just the best thing ever!) was the wonderfully friendly service and the value for money. $18.50 a person for the food and beverage seemed really reasonable, given the attention to detail for each of the items included. Works really well for a girly catch up and was a brilliant prelude to a shopping session.